We had arrived just in time. The high tide was starting to recede giving us easy access to the beach yet there was still enough water covering the base of the jetty posts. If you arrive at this destination at the wrong time you’ll find sticks in mud. 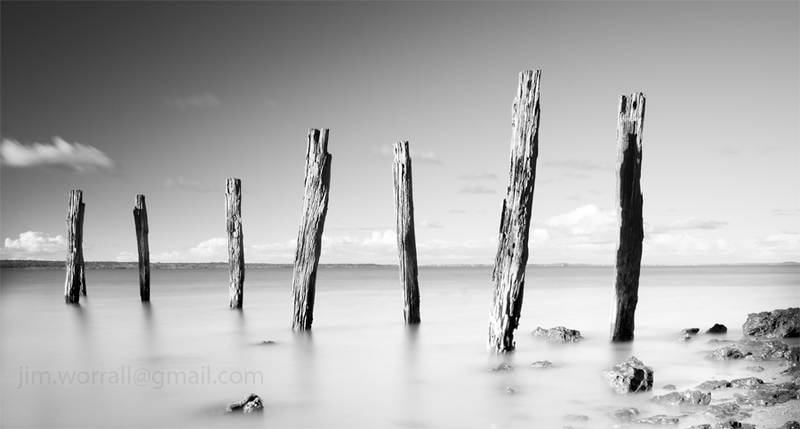 Below – Two images of the Tenby Point jetty remnants. Pictured below – On the way back to the car park the water had receded enough to reveal the tangled root system on this Tenby Point icon. There’s something quite magical about Tenby Point. It’s one of those areas I feel compelled to visit from time to time. A great surprise this visit was to find the road is now surfaced with asphalt. I’m going to miss all the corrugations and pot holes that once adorned the old dirt track leading to the beach. A Photographic Trip to Tenby Point. 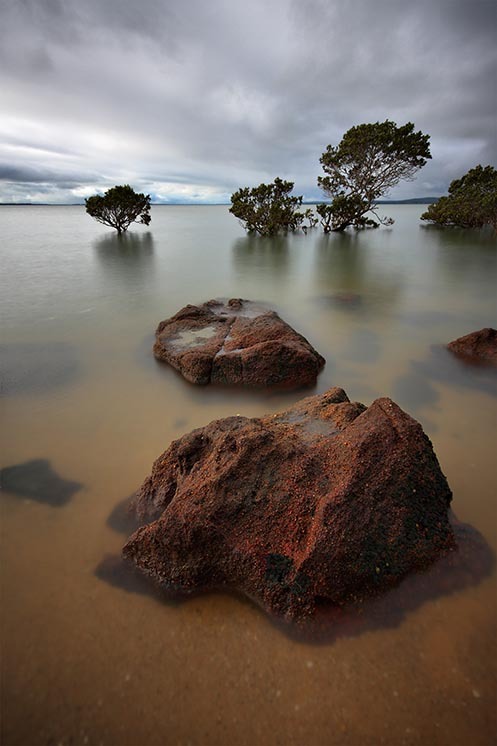 Tenby Point is a coastal village located on the shores of Westernport Bay, just a few kilometers east of Corinella, Victoria, Australia. On this particular photography excursion conditions weren’t ideal. The sun was harsh and high in the sky, and there were no clouds around. Due to these harsh light conditions I chose to make a series of high key images whilst the tide was favorable. It’s important to know what the tides are doing here from a photographer’s prespective. I think it’s best here to avoid visiting at low tide unless you’d like images of sticks or trees sitting in mud. 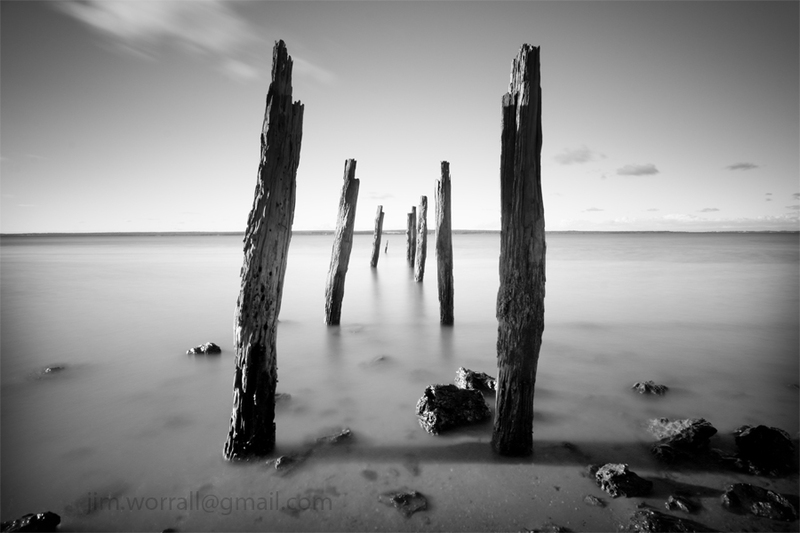 The black and white images in this post were taken with both an ND400 and an ND8 filter attached to the end of the lens to achieve long exposure times in bright sunny conditions. The goal behind using such heavy filtering is to achieve long exposure times in order to blur as much detail as possible from the sky and water. The result is a more minimalistic image. Down amongst the Mangroves, Westernport Bay. You certainly have to admire the hardiness of the Mangrove tree. 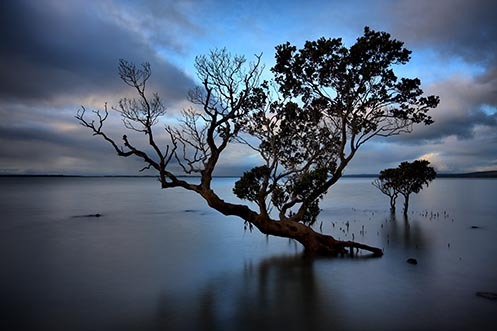 It thrives in poor quality soil in tidal areas, and twice a day has it’s roots submerged in salty sea water. 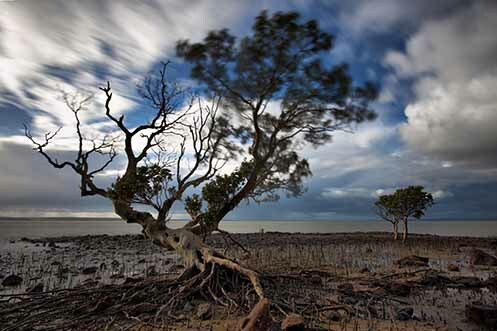 Under storm conditions the Mangrove is battered by both wind and waves yet it still manages to hold firmly. 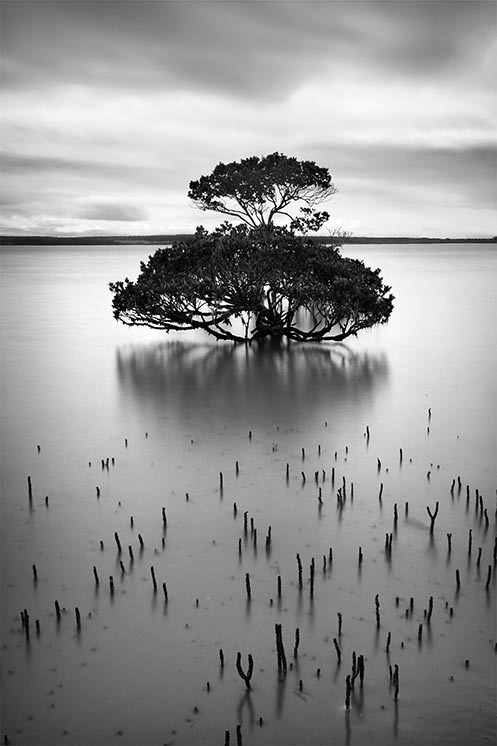 The Mangrove tree is also an interesting subject from a photographer’s perspective. At high tide with the roots submerged it’s fairly easy to photographically isolate the subject from it’s surroundings by using a long exposure time to smooth any waves around it’s base and blur any clouds in the sky. 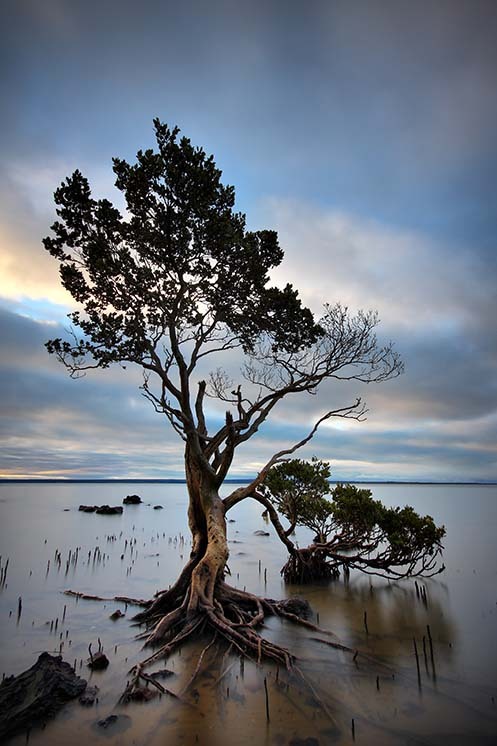 At low tide the Mangrove tree has it’s roots exposed creating potentially a new subject of interest for the photographer. The long roots are often intertwined with each other giving the impression of writhing serpents (perhaps that’s just my imagination running wild). Below – Wild n’ Woolly a long exposure with the roots exposed and the leaves thrashing around in the wind. 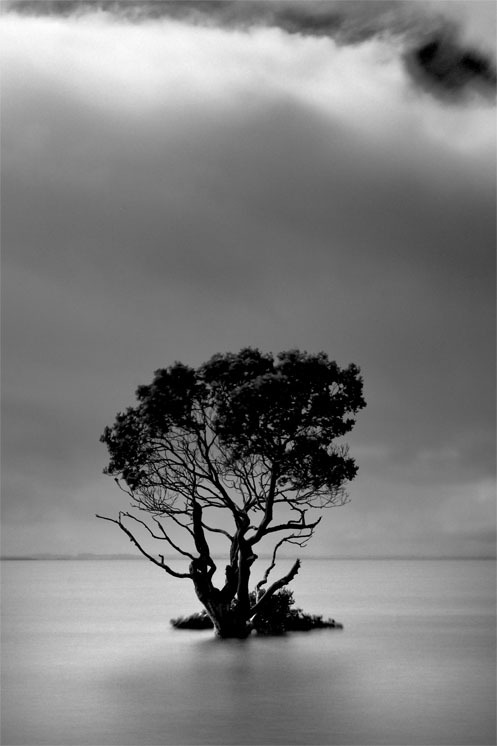 Below – On Borrowed Time the same tree as above but at high tide.